ELearning is projected to become a $325 billion industry by 2025, according to Forbes. As online learning software is more widely adopted, the available options for learning tools expands. The top online learning solutions are LMS software (learning management systems) and LCMS (learning content management systems). Based on name alone, these solutions sound like very similar platforms. While they do share functionality, some important differences come to light when comparing LMS vs LCMS. A learning management system and a learning content management system are two very different types of HR technology. Although they both tend to be modules available in talent management software, they each fill different roles in administering online educational tools to a workforce. The use of one or both of these modules is a strong business strategy that can help improve employee engagement and be used as an advantage in the recruiting process. In short, learning management systems are comprehensive platforms for the implementation and evaluation of electronic learning courses or corporate training courses. They handle many different types of functionality aimed at effective administration of eLearning tools. As a part of administering these tools, many learning management systems are available as employee self-service solutions. Learning management systems can help identify educational goals, collect data on learners, supervise learning practices or handle other elements of learning. In addition to actual eLearning modules, learning management systems can also help with employee registration and tracking or assessment. One of the core modules for learning management systems often include direct testing. Learning management systems can help managers set up online tests for workplace safety, fire risk or anything else that a worker has to learn about (and demonstrate competency in) when entering a workspace. At the same time, learning management systems can also handle much more evolved tasks and assessments for individuals in skilled jobs. Furthermore, an LMS can help administrators figure out how to access live courses or how to accelerate training across a large number of employees. A learning management system also helps with reporting and in-depth analytics. The results can help build knowledge of talent development. For example, a learning management system can involve modules for compliance training, but also offer functionality to see how each staffer at any level of business understands compliance. This dual functionality means LMS systems can facilitate learning and also allow leadership to see how eLearning is having an effect across the business. Other aspects of some LMS systems involve management. Because eLearning assessment is so similar to performance assessment in certain ways, learning management systems sometimes integrate features such as appraisals, competency evaluation and skill assessments. Because they are so comprehensive and broad, learning management systems are often highly customized to the type of business in question. Corporate training systems administered using learning management systems have various types of tasking, eLearning implementation and different setups for employee evaluation. They are very central utilities for making sure a company’s investment in electronic education is having the right effect. In contrast to learning management systems, a learning content management system is simply a platform for handling a set of eLearning resources for a company. In evaluating what a learning content management system does, it’s often useful to look at each piece of content or courseware as its own individual “unit” and understand how the learning content management system platform helps with administration. For example, one key goal of learning content management systems is more granular control in publishing courseware. The system may follow a piece of coursework through its life cycle, considering creation, collaborative work, use in the field and reuse after repurposing. In fact, the repurposing of content is a major part of what learning content management systems offer. Many of these tools feature template-driven designs that help with updating and continually handling large numbers of eLearning content pieces. Workflow integration is another major principle of what learning content management systems offer. One way to think of a learning content management system is as a sort of encyclopedia or formal structured repository for eLearning content. Additionally, learning content management systems offer functions that facilitate customization and sharing. Individuality-enabling course building tools allow users to create educational materials that best fit their company objectives.  Other features, such as branding components, tailor pieces to your business’ specifications. Once your courses are created, they can be distributed throughout your organization with LCMS sharing capabilities. Integration with a learning management system simplifies sharing, but many learning content management systems have their own built-in messaging platforms or other collaboration abilities. Language translation and additional features aimed at international cooperation streamline global teamwork. While learning content management systems at their core are organizational tools for digital course content, supplementary features move the software beyond creation and storage, into a slightly more all-encompassing platform. Similarities between the two tools involve, perhaps obviously, that both are platforms for the management of professional learning. These systems modernize corporate learning and streamline the training process for businesses. Automation is a major shared feature of each system, as well as an objective for companies adopting the tools. Customization is available in LMS and LCMS too, both for content creation and execution. In addition to standard new-hire training or company-wide technology updates, learning management and learning content management software facilitates continued education, often tailored to each employee’s individualized path. While the usage goals for these systems differ, their ultimate goal of providing knowledge to workforces is the area where LMS and LCMS share the most similarity. This common pursuit of digitized workplace education means LMS and LCMS are often adopted together and used as an all-inclusive solution for business-based learning management. Reporting features are one capability that differentiates LMS from LCMS, shown here as part of KMI LMS. When comparing LMS vs LCMS, begin by considering each system’s basic features and purpose. As previously noted, a learning management system is used to administer and manage lessons, as well as evaluate employee performance. Learning content management systems are more of a creation and hosting platform for educational materials. Obviously, learning management systems have a broader scope of functionality than learning content management systems. Some vendors offer pre-loaded content in their LMS, and many also offer the option to import custom content, created in an LCMS or otherwise. The base difference between the two is simply the end-usage goals of each system. Learning content management systems build digital learning content, and learning management systems put that content to use. As a result of these usage differences, the main users of each system differs as well. Learning content management systems are used by lesson creators and management. 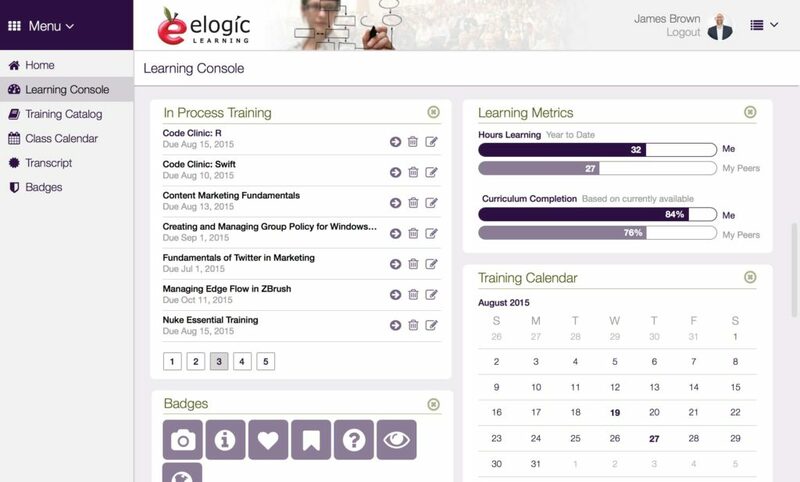 Learning management systems are primarily used by employees. In some cases, learning management systems and learning content management software will be integrated. It makes sense to put together these two HR modules — one is responsible for the active use of eLearning pieces, and the other for warehousing and evaluating those pieces. It is relatively common for the two systems to be intertwined in some way. To determine your need for one or both of these tools, evaluate your learning goals and current infrastructure. If your company has an established training structure that is satisfactory, a learning content management system alone may suffice. The software can serve the function of organizing and updating your existing course materials. If you are operating from a more baseline learning management framework (e.g. no educational architecture or disconnected, mediocre classes), a comprehensive learning management system and a learning content management system will likely better serve your organization. Logistical factors such as budget, timeline and technical considerations should also be thought of when deciding between systems or choosing to integrate the platforms. 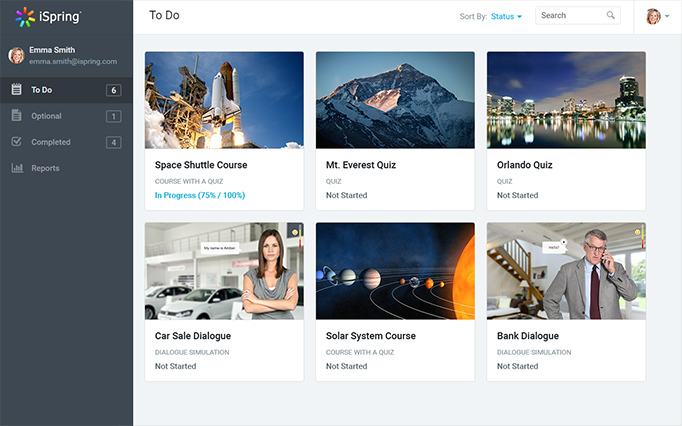 Courses displayed in iSpring, an integrated platform that allows for content creation, as well as some LMS features. Explore the features and functionality of these systems to enhance and innovate digital learning in your business. Continued education, with the assistance of software, has a number of positive effects on any business. Employees are able to maintain an up-to-date skill set. Meanwhile, your workforce is equalized, as everyone can learn the same skills and stay on the level of their peers. Learning management systems and learning content management systems facilitate increasing the knowledge of your team, improving your business overall. If you have any questions about the comparison of learning content management system vs learning management system, leave us a comment below! See the Price/User for the top Learning Management Software... plus the most important considerations and questions to ask. Pricing, Ratings, and Reviews for each Vendor. PLUS… Access to our online selection platform for free.